In Meghan Markle news, you can buy her engagement ring for $73. Sort of. Well, do we have news for you. You can now get your hands on Meghan Markle’s stunning three-diamond engagement ring for less than your weekly coffee and lunch budget. It’s not the real thing, unfortunately – but the £30 version, which equates to roughly AU$73. The Buckingham Palace shop is selling a ‘Statement Ring’ that’s heavily inspired by the one Prince Harry gave the Duchess of Sussex last year. The two rings do have their differences of course. 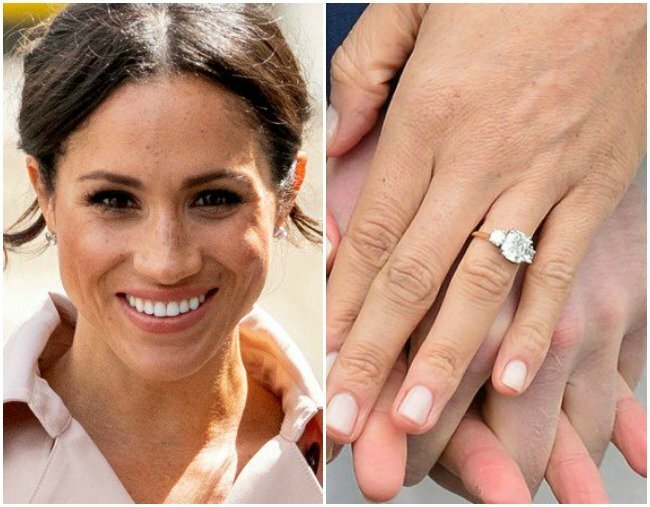 It’s made with crystals over diamonds and unlike Meghan’s yellow gold band, the three crystals are set on a palladium-plated ring… but minor details right? Behold: the three-stone stunner. Image: Getty. According to PEOPLE Magazine, Harry designed the ring himself, with the help of British jewellers Cleave and Company, who are also the preferred jewellers of Harry&apos;s grandmother, Queen Elizabeth II. The diamonds also hold their own special significance too. The central stone was sourced from Botswana, where the couple spent their third date, and the two smaller stones are from Princess Diana&apos;s personal collection. But not to be beaten, this is what YOUR version could look like. And while it doesn&apos;t come with the promise of a royal wedding, or an official title, you do get a fancy-looking ring box. Just like Meghan&apos;s. Image: Royal Collections Shop. Now... if you don&apos;t have the annual leave, or expendable income for a quick trip to London, the official Royal Collection Shop does offer international shipping on purchases, but Aussie residents will have to fork out another £30 for shipping and wait 20 days for their precious cargo to arrive. To be honest, this sounds like a great excuse to plan a UK holiday ASAP. Would you buy yourself a replica of Meghan Markle&apos;s engagement ring? Tell us in a comment.